Combined sign-off and sign-on of the PBS affiliateTV station for the Knoxville and Tri-Cities area of Northeastern Tennessee. The sign-off is missing the first several seconds where the call letters are announced, and ends with an abrupt cutting of the carrier.  The sign-on is preceded by the final fifteen seconds of the "Moog SSB" clip (to see the MOOG SSB clip in its entirety, view the 1978 KABC-TV sign-off). This recording was contributed by Matt Sittel, who was residing in Kingsport at the time he recorded this clip. Matt, who currently resides in Belleview, Nebraska, is a radio and TV "Station I.D." enthusiast, and some years back had his own website that featured hundreds of MP3 clips of station ID's from all over North America.